Because there are just too many brands to choose from, we decided to review only the best and most current brands of camping tents. Without a fear of making our hands dirty in the process, we took it upon ourselves the task of putting to test more than 60 camping tents in each category. Finally, we came up with the list of only the best tents that will be worth every cent of your bucks. To make it easier for you, we have sorted the various tents according to their capacity and type. Whether it is the best single person pop up tent, 2 person ridge tent or a larger family camping tent you are looking for, we list the best camping tents in each category. Take a look and hopefully you will be able to pick one that best suits you. Best Camping Tents: Which Category Best Suits You? We believe that the best one person tents should be lightweight enough and while at it retain a sturdy build that makes them compact and dependable. While others have dimensions large enough to accommodate up to two individuals, a majority are just a perfect size for a single individual. Solo campers will most definitely expect that the best backpacking tents should be easy to set up and disassemble, have a smaller packing size but still have a large enough size to comfortably accommodate them when put up. Anything between 2.5 lbs and 5 lbs is lightweight enough for backpacking. Here are your best bets for single person tents. If you like going out with your partner, you will most definitely be looking for the best camping tent for a couple. Tents in this category should be easily portable hence necessity for lightweight construction material. And while some construction material may add to the weight of a tent, we believe that two person tents are small enough and you shouldn't compromise on material for the sake of weight. Therefore, picking the one that is sturdier rather than the lightest should work best for your long-term satisfaction. We list only the best two person tents that take not only both of these aspects into consideration but also other aspects inherent in the best camping tents. One advantage of buying a three person tent over a two person or a one person tent is that while it can be suitable for a group of 3 individuals, it can also be used by two campers or one camper with more comfort. This means that you become more flexible and can choose to go camping solo or tag a friend or two. The advantages become even more if you are a claustrophobic individual or would just like a larger operating space. With that said, one thing you should have in mind is that 3-person tents will most likely cost higher than their smaller counterparts of similar quality. Given their advantages though, three person camping tents are cost-effective in the long run. The ALPS Mountaineering Meramac 4-Person Tent is our ultimate best pick in this category. Our choice is not only determined by the robust and sturdy nature of this camping tent but also by the fact that this tent is easy to set up and features two doors. Albeit costly, we believe that this tent is the most ideal for a small family or for those campers who like to tag along their camping cots for comfort. 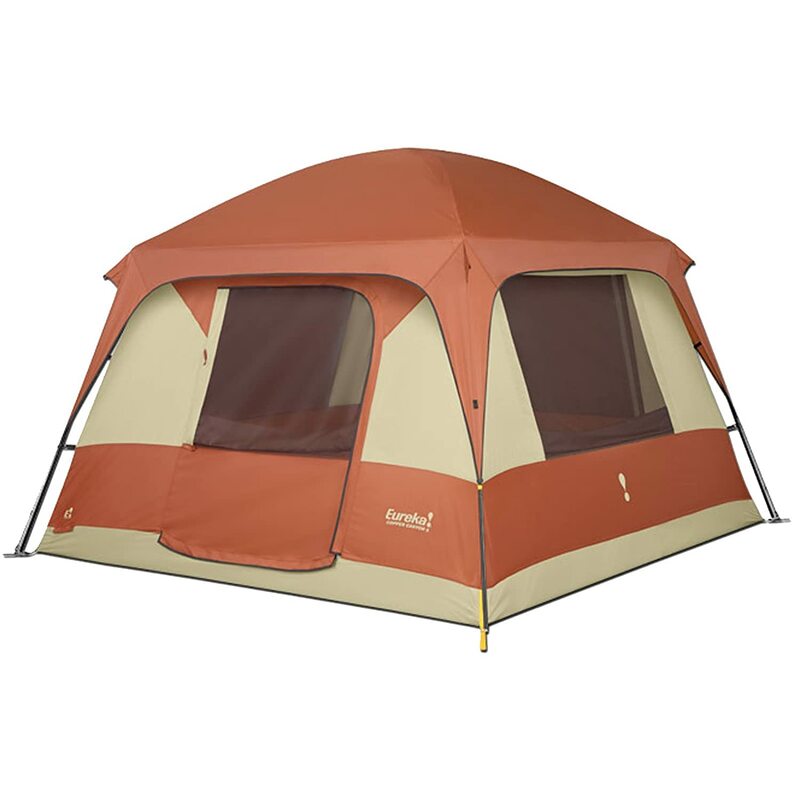 The other tents in this category are hand-picked for your comparison and for a variety of choices. Just like with the tents in the other categories, a perfect four person tent should be strong enough to withstand harsh weather conditions, be easy to put up and dissasemble as well as be easily portable. We took all these factors into consideration while testing and reviewing these tents. Therefore, you are very unlikely to go wrong if you go by our choices. Six person tents give you the freedom and space to do more. While made with a capacity to accommodate up to six people, the 6-person tents can be used by fewer individuals who value the space to do more. Putting up a mini-kitchen in the tent, erecting some backpacking chairs or sleeping cots will make your life a little more interesting. You should however note that the more items you put into your tent, the lesser the space becomes. The tents that made it to this list featured a favorable height, were rain-proof and weather-resistant and had poles strong enough to resist snapping. Durability was also a major consideration which made us to factor in the construction material. A family camping tent can never qualify to be termed as best if it does not feel like a home away from home. And there are basic fundamental features that a family camping tent must feature for it to offer the comfort and warmth that are inherent in a home away from home. Atop the features list should be the spacious interior that doesn’t feel claustrophobic, affordability, a seamlessly easy setup and sufficient durability. Whereas some of the four-person and six-person tents will comfortably accommodate smaller families, we chose to focus on classifying the larger tents with a capacity of more than six as the family tents. This is because during our tests on different tents, we found out that smaller tents aren’t as comfortable for a family and have got some limitations. Even for a smaller family, a larger tent is the best because apart from giving you a larger storage for the basic essentials, it also allows you to be freer with your portable camping chairs and cots. Additionally, the larger tents discussed herein can be divided into different rooms which accommodate the different cohort of a family. Often loved for their simplicity, instant tents (also referred to as instant-setup tents) are those tents that set up within the shortest time possible. They adopt a unique design that features pre-installed poles to lessen the setup hassles. Notably, instant tents come in variety of styles and can be classified with other non-instant tents into such classes as dome tents, cabin tents and even tunnel tents based on their shapes. Sizes of these types of tents vary as well and range from the smallest one-person to the biggest family-sized camping tents. If you are clumsy and likely to misplace some parts, if you like being prepared against Mother Nature's unpredictability, if you like some extra time to spend on hiking or other outdoor activities, instant tents are your best bet. If you have been calling for fast, simple and lightweight, manufacturers have responded to your call. Pop up tents have been ingeniously crafted with simplicity and speed in mind. Their frame, made of elastic steel wires, confer the self-setup ability to these tents. Remove it from its storage bag, throw it on the ground and a pop-up tent is up and ready for habitation. As a matter of fact, most of them set up in less than 10 seconds. Folding them down for storage is a bit of a herculean task for beginners, so you may want to run a few fold-down trials before heading out for camping with these types of tent. Noteworthy though is their easy-peasy operation once one gets used to them. Nothing much to write home about this type of tents except that they are shaped like the capital letter "A" hence their alternate name A-Frame tents. A classical design of tents whose production has seen a tapering existence, ridge tents are slowly but surely losing popularity. Is the main reason for the diminishing popularity the fact that ridge tents have the least headroom? We don't know for sure but what we know is that despite their limited availability, these tent types have a soft spot in hearts of a few outdoor lovers. Particularly, if you were once a scout and adventured the mountains with these types of tents, you may want to reminisce about those outdoor moments by setting up not any other but specifically the ridge tents. A fully geodesic tent features more than 5 poles that criss-cross atop of the tent to form a compact, robust structure that is resistant not only to the strongest of tempests but also to other elements such as snow loads and storms. Outrightly not your ordinary type of tent. In a bid to save on weight, some manufacturers opt for the semi-geodesic designs which feature less than 5 poles that cross multiple times. A little bit weaker than a fully-geodesic tent but still reliable. Still, a few manufacturers are going a step further by replacing the geodesic poles with inflatable "poles". Though usually costlier due to their construction technology, geodesic tents can be counted upon in almost any kind of weather. You may seriously want to consider a fully geodesic tent if you are planning to camp out of the favorable weather seasons. Are geodesic tents worth their cost? Probably not if you are an ordinary camper. But if you are a real survivalist willing to adventure out of season, then you will probably never regret rewarding yourself with a geodesic tent. Usually anchored on a single central pole, tepee tents sport either a conical or a pyramidal shape. These shapes are confered by their footprints which are either circular or squared/rectangular. Definitely not the most robust of tents and you will expect a mild tempest to bring a tepee tent down. You may want to think of them as a reverse-engineering of glamping (luxury camping) or yard camping. As you would naturally expect, their headrooms are largest near the center and taper towards the sides. Though ultimately simplistic, the devil is in the detail for tepee tents. They are lightweight, easy to set up and can accomodate a large group of campers at one go. If you are considering summer camping with family or friends, tepee tents may be your best bet. While they haven’t been around for a long time, truck bed tents are becoming popular among many contemporary campers. They are the best tents for car-camping and which you shouldn’t be left behind on. Truck bed tents are designed in such a way that they fit perfectly on the small camping trucks to offer protection against rain and unfavorable weather conditions such as cold and wind. Their main advantage is that on top of freeing you of the worries of weight, they are easy to move around with since they are meant specifically for attaching on the truck. Use them for a weekend away on a local campsite or to enjoy a lengthy summer break while on the move. For those who cherish RV camping, trailer tents are a thing. In most instances, trailer tents are a canvas extension of a truck's back, creating extra room on the ground. In other instances, these tent types come fully equipped with a tow trailer and can be pulled behind a motorcycle or a small car. Still, others are mounted atop the truck and have ladders for climbing and descending. Whichever way you look at them, trailer tents provide extra roomy space on the trail. You can sleep, set up camping chairs, play and cook in a trailer tent. Whether you choose to go solo, with family or with a group of friends, camping is a great recreation and pastime for people of all ages. It is however important to note that the type of tent you tag along will either make or break your camping hence the need to invest in the best camping tent for your needs. Again, irrespective of whether you are destined for a sightseeing mission or a basecamp, you need a comfortable home away from home. Let us look at the most important tips to consider when shopping for a backpacking or camping tent! Not all tents will score highly in all the features discussed below. However, depending on your budget and preferences, you will still certainly find a tent that will make your camping, backpacking or hiking memorable. The most important aspect to consider when shopping for a camping or backpacking tent is its capacity and this will mainly depend on the size of your group or family. Again, while most tents have vestibules and interior pockets for storing your camping gear and other particulars, you need to check out if you may need additional space for your child, pet or extra gear. The smallest camping tents are one person tents but you will easily get a tent for any group of people as there are a variety of 1, 2, 4, 6, 8, 10 person and larger tents out there. 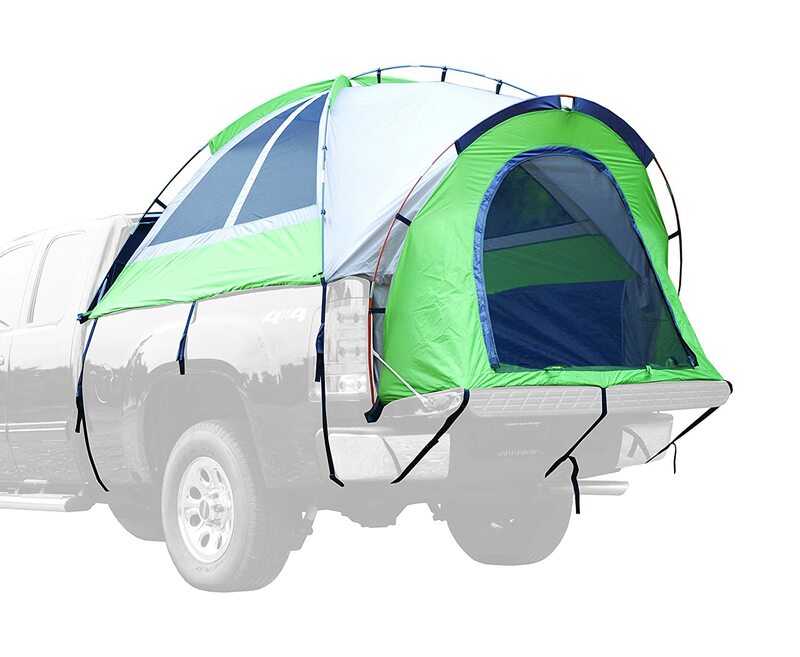 You can also get options for family and truck tents. The main important considerations when choosing the best truck bed tents is the size of your car or tent. For other tents, you can consider upsizing the occupancy of your tent by 1 person and this should be a general rule if you are bringing along a small child or a pet, if the group members are large people, if any of the group members are claustrophobic or if they turn a lot at night and may need a bigger space. But when do you need more than one tent? Well, when you are a couple with teenage children then one tent will not prove very conducive for all of you. You can therefore choose to purchase an extra tent or divide your tent into two rooms using a curtain fabric. Peak Height: The peak height of a tent is measured perpendicularly from the tent floor to the highest point in the tent roof. While this alone will not determine how livable a tent is, it gives you the idea of what activities you can carry out when in your tent. For example, a longer peak will enable you to dress up and carry out some of in-tent activities in an upright position. On the other hand, a very short peak height may only allow sleeping and sitting. Floor Area and Dimensions: The floor area of most tents is provided in square footage or square inches and is the overall livable space a tent can provide. Depending on your preferences, you need to look at the floor area along with the dimensions. This is due to the fact that two tents may have a similar floor area but varying floor dimensions. If you are over 6 feet tall then you need a tent that has a floor length of at least 90 inches. On the other hand, people who need an extra elbow space or toss and turn at night are advised to consider shelters with wider tent widths. Rain fly Color: A bright colored tent fly allows light into the tent giving you a more pleasant and livable abode. Tents with incorporated LED lights or flashlights, though, do not have to be bright colored. This is not known to many but the seasonality and the weatherproof ability of a tent determines where and when you can use your tent. The seasonality of tents is basically divided into three; 3 season tents, 3-4 season tents and 4 season tents. 3 Season Tents: By and large, 3 season tents are the most common group of tents. This is credited to their lightweight feature and the fact that they are viable for fall, spring and summer. They also have sufficient ventilation to allow incredible airflow while their mesh panels will faultlessly keep out marauding insects. When pitched with a tout rain fly which will usually be part of the package, 3 season tents will withstand downpours. They are however not the best choice of tents for extreme and continuous exposure to very harsh storms, heavy snow or strong winds. In general, the main purpose of 3 season tents is to keep you warm during light snow or rain, protect you from direct sunlight, provide privacy and keep you safe from inducts and other bugs. 3 - 4 Season Tents Also known as extended-season tents, 3+season tents consist of 1 or two poles and have fewer mesh walls than pure 3 season tents. They are also good summer tents but will conveniently extend to serve you during early spring and towards the end of spring when you are likely to encounter moderate snow. They offer an incredible balance of warmth retention, good ventilation and sufficient strength. 4 Season Tents: The main features of 4 season tents lie in their dome-shape design and choice if materials. They are made of more poles and thicker fabrics than 3 season tents to make them strudier and warmer. They are also known as mountaineering tents and their main purpose is to provide protection from fierce winds and more than moderate snow. Tent weight specifications determine how portable a tent i and it is most likely that we all prefer ultralight tents. However, ultralight tents may sometimes compromise on other key tent features such as space and additional accessories. A comparison of tent weights entails specs like packaged weight, trail weight and packed size. Packaged weight is the total weight of the tent components and accessories at the time of purchase. They include the tent body, poles, rain fly, stuff sack, instruction manual, stakes, pole sack and any other inclusions. The minimum trail weight is the weight of the tent essentials which only include the body, poles and rain fly. Finally, the tent packed size is the amount of space the tent takes when packed. The type and quality of materials used in manufacturing a tent are essential for its ability to withstand harsh weather conditions as well as its ability to last long. Tent poles are mainly made from aluminum materials that guarantee lightweight and strength features. The most durable tents have the best pole materials. Tent fabrics are mainly made from nylon or polyester materials. Higher denier (D) fabrics are more rugged and suitable for harsher environments while lower denier fabrics are more lightweight. However, it is only advisable that you compare deniers if the fabrics are identical. Tents are either freestanding or non-freestanding. Freestanding tents are designed to stand without the use of stakes. Simply set the tent up and lift to an even ground and you have your tent ready. On the other hand, non-freestanding tents are secured on the ground using stakes. They have less robust poles hence more lightweight but are difficult to reposition after set up. If you are backpacking solo or in a group but need to be faster and more efficient, you need a tent that is setting up is a breeze. Essential features to look for easy set up include pole hubs, pole clips, sleeves and color coding. Finally, for effortless set up in the wilderness, it is advisable to always set up your tent before you leave home at least once or twice to muster the entire procedure. You certainly need a place to store some of your backpacking gear. It is for this reason that we advise campers to consider the availability and size of tent vestibules before making a decision to buy the tent. Your pick for the best camping tent should have a vestibule that will accommodate all your backpacking gear. Again, consider the number of interior storage pockets as they will not only offer storage space for small items but also essential for keeping the interior of your tent organized by keeping items off the ground. A tent that provides sufficient airflow will prevent condensation buildup in the tent. You therefore should choose a tent that has mesh panels and windows particularly for summer camping. However, these mesh panels and windows should be adjustable and zipped in place when there is cold weather. A tent with an adjustable rain fly will also provide great ventilation and star viewing during warm nights. It is no longer just a matter of the shape, size, zippers and other door adjustments! The focus is now on the number of doors. For one person tents, a single spacious door will serve you well. However, tents designed and used by more than one person should have an extra door for ventilation, entry and exit. You get what you pay for! Well, this is a shopping phrase that is both true and false when it comes to tents. While there are a number of high end tents available in the market with amazing features for you to choose from, you will not miss fairly priced tents that will satisfy your camping needs.